A decade ago, when Kim Koopersmith ’84 spoke on industry panels about her rise up the law firm ladder, she often downplayed her own accomplishments. Today, Koopersmith, one of three women who headed AmLaw Top 50 firms in 2016, tells a different story. 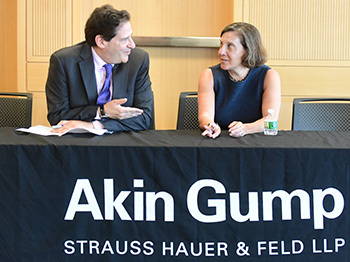 She is confident explaining to audiences that her current position as partner and chairperson for Akin Gump, the 900-plus-lawyer global firm, did not happen by chance. During a March 27 Business Law Practitioners Series talk at Fordham Law, she encouraged students, in particular women, to unabashedly emphasize their skills and expertise. Koopersmith addressed gender equality issues in law firms, areas of opportunity among large law firms, and why she wished she could do law school over during her hourlong question and answer session with J.D.s and LL.M.s. The student organization Fordham Law Women co-sponsored the event with the Fordham Corporate Law Center. Among partners at American law firms, only 18 percent are women. Koopersmith, a mother of two adult daughters, litigated for Akin Gump for 14 years prior to being named U.S. managing partner in 2008. She has also participated in numerous community, civic, and charitable activities, including serving on the board of the NAACP Legal Defense and Educational Fund and chairing the board of Equal Justice Works. Law firms must be flexible and find ways to accommodate and challenge women, so they stick out the long journey to partner, said Koopersmith. Akin Gump, she added, focuses on providing lawyers of all ethnicities and genders developmental opportunities necessary to becoming partner, she added. “Our job is to make it enticing to stay,” Koopersmith noted, in reference to increasing the number of women partners. 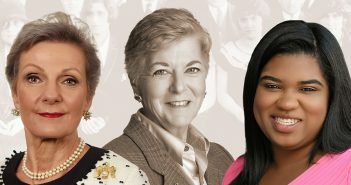 Asked how to judge if a workplace would be friendly toward women, Koopersmith shared the advice she gave her daughter’s friends: Be mindful of how non-lawyers are treated by the firm’s lawyers. For all young lawyers, rapid change among law firms is creating a large number of opportunities at law firms in areas such as compliance, cybersecurity, and privacy that intersect with a number of more established practice areas. Koopersmith praised Fordham Law for targeting these areas. She cited litigation in particular as providing the most challenges and opportunities to employ innovative thinking. “For people who want to litigate, thinking about where litigation is going, the expertise you have and your ability to consider technology your friend not a foe, it’s an area that will distinguish firms and people based on their abilities to adapt,” Koopersmith said. Much of today’s legal concerns were barely a blip on Koopersmith’s radar when she attended Fordham Law, she told students. At the time, she considered public interest work but ultimately went to work for a firm because she knew how to apply for those jobs. Though she heads a major firm, she said she supported students who sought public interest jobs. “The world needs people committed to all kinds of causes,” she explained. While much of her presentation focused on answering career-related questions, Koopersmith left one parting note about the law school years and the joy of being a lawyer.